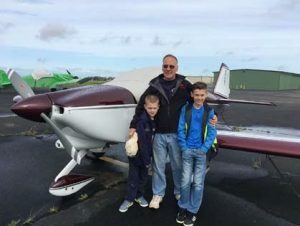 Like a lot of us, Mike Moore had always dreamed about flying but finances, family, and life got in the way of him pursuing his dream. Finally, the stars were in alignment. Mike was semi-retired, and finances were no longer an issue. Mike and his wife, Kira, took a discovery flight out of Auburn about five years ago and they both loved the experience. The hook was set in both of them. Mike and Kira both got their Private Pilot’s License. ago and today manages his portfolio of investment properties. Mike can often be seen at the airport with his two sons, Ryan, who is twelve, and Dylan, who is ten. Mike says that Ryan is passionate about aviation and without a doubt will be a commercial pilot. Mike brings his sons to the EAA breakfasts often. Mike is easy to spot at Lincoln Airport. He is the guy with the “RV Grin.” Mike, thanks for joining Chapter 1541 and congrats on the RV-6A purchase.